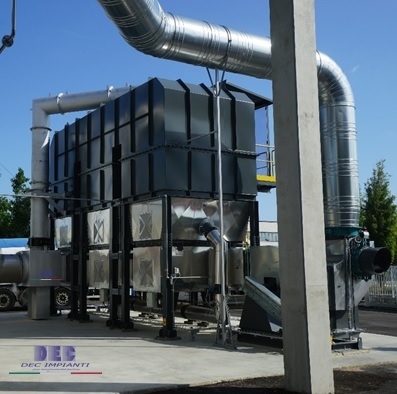 Whenever you have to face a "non recoverable" stream of VOCs, a Regenerative Thermal Oxidizer (DEC.RTO™) or a Catalytic Thermal Oxidizer (DEC.CTO™) could be the solution: sometimes the VOC stream is too complex to be recovered or the quantity of solvents is not interesting to go for a solvent recovery system, based on activated carbon adsorption. The HEAT is usually recovered to pre-heat the SLA stream, in order to save on "thermal energy" (provided through gas CH4 - methane); if producing extra heat through oxidation of solvents, an energy recovery system shall be foreseen (typical applications are ranging from heating up air for dryers, steam production, heat tranfer fluid heating, water heating - industrial or sanitary, etc.). VOC and HAP laden air from the process is drawn into the oxidizer system with the help of the fan system (V-1). Through high performance valves, the SLA flow is directed through high efficiency energy recovery chambers, where is pre-heated; the process gas and contaminants are progressively heated in the ceramic media beds as they move toward the combustion chamber. Once oxidized in the combustion chamber, the hot gas releases thermal energy while leaving through the stack, going through the ceramic media bed, exchanging the thermal energy and cooling down. Thanks to the switching valves, the flow is alternatively reversed: thermal energy is recovered and the flow, in the following cycle, is pre-heated; this cycle is efficiently reducing the auxiliary fuel requirement, with self-sustaining operation (with no auxiliary fuel usage) even at low concentrations, thus representing an operational cost reduction. Basically an oxidizer is handling the transformation of the pollutant(s) into products with a reduced environmental impact. High temperature emission (as a result of non complete thermal energy recovery).